Give your workers the real-time information they need to streamline inventory management in your coldest environments with the Omnii XT15f. 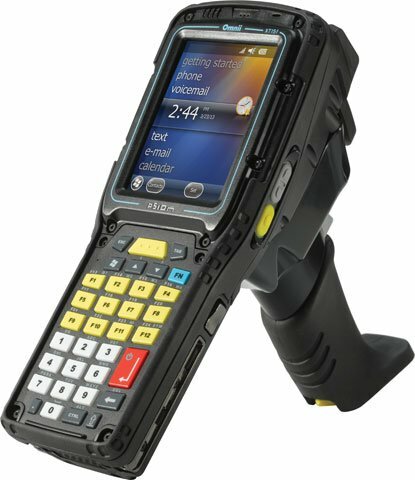 The Omnii XT15f builds on the Omnii adaptable platform, adding features that enable your workers to achieve flawless fulfillment in the coldest corners of your supply chain "" from the loading dock to a freezer in an ice cream manufacturing plant to an outdoor yard in the arctic cold of a wintery day. Wi-Fi (80211a/b/g/n), 1D Laser Scanner, Windows CE 60, Gun Grip, AlphaNumeric Keypad, 5300 mAh Battery. Interface Cables And Charging Cradle Sold Separately. Arctic, Windows Mobile 65, English, 34 key Freezer Numeric, 1D Laser SE1524ER, Arctic Freezer 5300 mAh Battery, PistolGrip. Interface Cables And Charging Cradle Sold Separately. Arctic With Extreme Duty Display, 512MB SDRAM/1GB Flash ROM, WEHH 65, ENG, 34 key FRZR Retro Num Tel 12 FN, 80211 A/B/G/N Bluetooth 20+ EDR, 1D AR-SE1524ER, FRZR 5300 mAh, PistolGrip, Tether Stylus. Interface Cables And Charging Cradle Sold Separately. Arctic With Extreme Duty Display, 512MB SDRAM/1GB Flash ROM, WEH 65, English, 58 key FRZR Retro Alpha Num Tel 6 FN, 80211 A/B/G/N Bluetooth 20+ EDR, 1D SR-SE965HP, Arctic FRZR 5300 mAh, PistolGrip Tether Stylus. Interface Cables And Charging Cradle Sold Separately. Arctic, Embedded HAndheld 65, English, 58 key Freezer AlphaNumeric, 1D Laser SE1524ER, Arctic Freezer 5300 mAh Battery, PistolGrip. Interface Cables And Charging Cradle Sold Separately. Arctic, Windows CE 60, English, Mobi Control And OTT, 58 key-Freezer Retro Alpha ABC Numeric Telephony 6 FN, Scanner 1D - Standard Range SE965HP, Arctic Freezer 5300 mAh Battery, PistolGrip. Interface Cables And Charging Cradle Sold Separately. Arctic, Windows CE 60, English, Mobi Control And OTT, 58 key-Freezer Retro Alpha ABC Numeric Telephony 6 FN, Scanner 1D - Long Range SE1524ER, Arctic Freezer 5300 mAh Battery, PistolGrip. Interface Cables And Charging Cradle Sold Separately. Arctic, Windows CE 60, English, Mobi Control, 34 key-Freezer Numeric Telephony 12 FN, Scanner 1D - Long Range SE1524ER, Arctic Freezer 5300 mAh Battery, PistolGrip. Interface Cables And Charging Cradle Sold Separately. Arctic, Windows CE 60, English, WAVELINK TE, 34 key Freezer Numeric, 1D Laser SE965, Arctic Freezer 5300 mAh Battery, PistolGrip. Interface Cables And Charging Cradle Sold Separately. Arctic, Windows CE 60, English, 34 key Freezer Numeric, 1D Laser SE965, Arctic Freezer 5300 mAh Battery. Interface Cables And Charging Cradle Sold Separately. Arctic, Windows CE 60, English, WAVELINK TE, 34 key Freezer Numeric, 1D Laser SE1524ER, Arctic Freezer 5300 mAh Battery, PistolGrip. Interface Cables And Charging Cradle Sold Separately. Arctic, Windows CE 60, English, 34 key Freezer Numeric, 1D Laser SE1524ER, Arctic Freezer 5300 mAh Battery. Interface Cables And Charging Cradle Sold Separately. Arctic, Windows CE 60, English, WAVELINK TE, 34 key Freezer Numeric, 2D Imager SE4600, Arctic Freezer 5300 mAh Battery, PistolGrip. Interface Cables And Charging Cradle Sold Separately. Arctic, Windows CE 60, English, WAVELINK TE, 58 key Freezer AlphaNumeric, 1D Laser SE965, Arctic Freezer 5300 mAh Battery, PistolGrip. Interface Cables And Charging Cradle Sold Separately. Zebra OneCare Service Center Essential. For renewals only. Does not include Comprehensive coverage. Does not include coverage for cradles.